Working on a college campus is nice for so many reasons, and one of my favorites is how things always seem to be in a state of flux. Visit a campus at any time of the year and things are likely to be quite different from the previous time you were there. In the fall the whole place is buzzing with excitement and anticipation; in the spring students are anxious and eager for graduation; in the summer you are likely to hear sounds of marching bands practicing, sports teams playing, or the steady rhythm and honking of construction equipment moving earth and pounding steel. However one of the most interesting periods is that time when fall semester ends but spring semester has not yet begun. Traffic is light, students are sparse, and staff are busy finalizing documents and preparing for spring while professors huddle in their offices trying to finish up grades or hammer out the finishing touches on a research paper. It was during that time when I went out on a chilly afternoon with my D750 + 50mm lens combination for (you guessed it!) a quick walk around Theta Pond, determined to get a few pictures of…something. I wasn’t quite sure really, but given that the sky was overcast and the students were gone I thought I might as well try and get a picture just to keep the creative juices flowing. I came back with several, which may or may not show up here on the blog in the coming weeks, but one stood out to me for a reason that I did not expect. 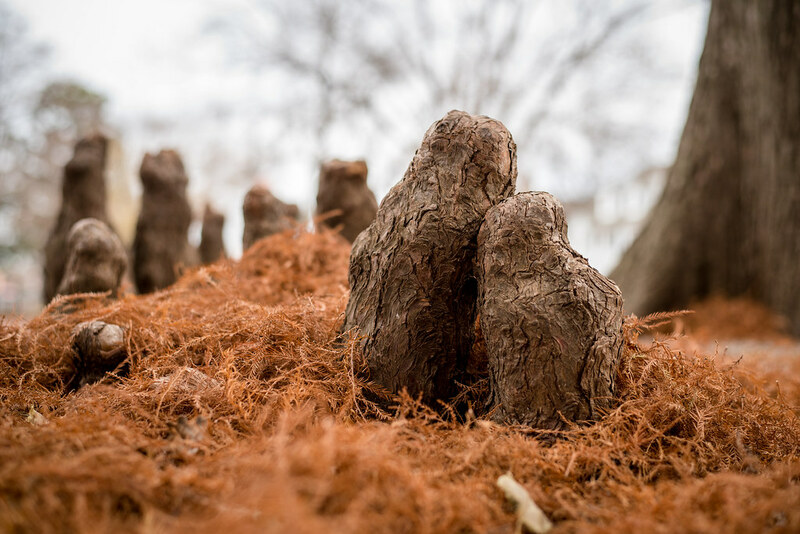 It was two cypress knees nestled in a bed of brown needles, and it seemed very much like two people offering comfort to one another on this chilly December day. Something about the image really hit home but I was also bothered by the composition since I was not quite happy with the background and, since I shot the original at f/1.8, the two roots which formed the subject of the picture were not in focus due to a crazy shallow depth of field. In short the photo was good, but a few steps away from one that I really liked. To remedy the situation I grabbed my buddy who works down the hall and the two of us went back to Theta Pond with the sole purpose of taking a picture of the cypress knees, but done properly. I knew exactly what I had in mind and had a much better sense of the exposure settings I would need, and the result is what you see here. To me it looks like a scene of sorrow, and while I don’t intend to bring anyone down by reading this, that’s just how it comes across to me. It’s a wife being comforted by her husband, with a small crowd of mourners and sympathizers (most likely friends and family) in the background who are there to offer support but know that this couple needs a minute to themselves. I don’t know why the couple is sad, and I’m not sure if they are looking towards the camera or away from it, but I like the intimacy of the picture and the sense of comfort it conveys. Well, to me anyway, but your own interpretation might vary. The forest creatures are paying their last respects to an innocent death. Perhaps an almost fully developed bird in an egg has fallen from the tree. All life matters. There–the perfect title for this piece! When I first saw the image, I was impressed by the colors, which immediately got my attention. As I read your comments about what you saw in the image, I appreciated emotion that you experienced. I think this gives us a glimpse into your marriage as well as the art of the photograph. Thanks for sharing. Two little aliens fallen in love! You can put those aliens in pods, but you can’t keep them apart, what’s meant to be, shall be, even at the edge of a pond. When your weekly blog hits my email, I study the photo first before reading or listening. This morning (running behind on reading emails) I smiled when seeing the photo being raised in the bayous of Louisiana. I knew immediately at what I was looking. But then the study began. The photo is spot-on. The colors sharp. The DOF, maybe not exactly what you like, but perfect for the emotion the picture evokes. And it does evoke emotion. Before reading your words, the same thought came to me. This is a picture of sorrow, yet of comfort. Very well done Simon.